His parents named him Cho-Liang, but you can call him Jimmy now that he's a repeat guest artist. 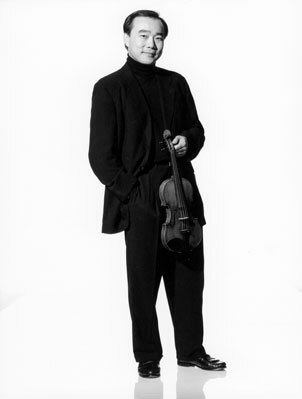 Violinist Cho-Liang Lin returns to the Honolulu Symphony Orchestra to fiddle in Prokofiev's audacious "Violin Concerto No. 2 in G minor" this weekend. House maestro Andreas Delfs conducts, also whipping out Mussorgsky's prelude to his uncompleted opera "Khovantchina," as well as a no-words edition of Wagner's "Ring" at the top of the bill. The "folksy" Mussorgsky piece, described as a musical landscape, is also called "Dawn on the Moscow River." The "Ring" is a kind of greatest hits from the 15-hour original, boiled down by arranger Lorin Maazel. It's fiery stuff, particularly the Prokofiev violin workout, which debuted to much praise in 1935. Taiwan-born Lin, 48, plays a 300-year-old Guarneri but also has new violins made to order for touring. Lin's father was a nuclear physicist in the sleepy college town of Hsinchu, an hour's drive south of Taipei. The boy began to learn to fiddle at age 5, then jumped to Australia for more intense studies, where he didn't escape the notice of New York's Juilliard School. Lin's Big Apple debut was at 19, and today he continues to teach at Juilliard. Away from the classroom and the stage, he's a Yankees fan. And cellist Yo-Yo Ma claims that Lin knows more swear words in Chinese than he does, a staggering accomplishment on its own.